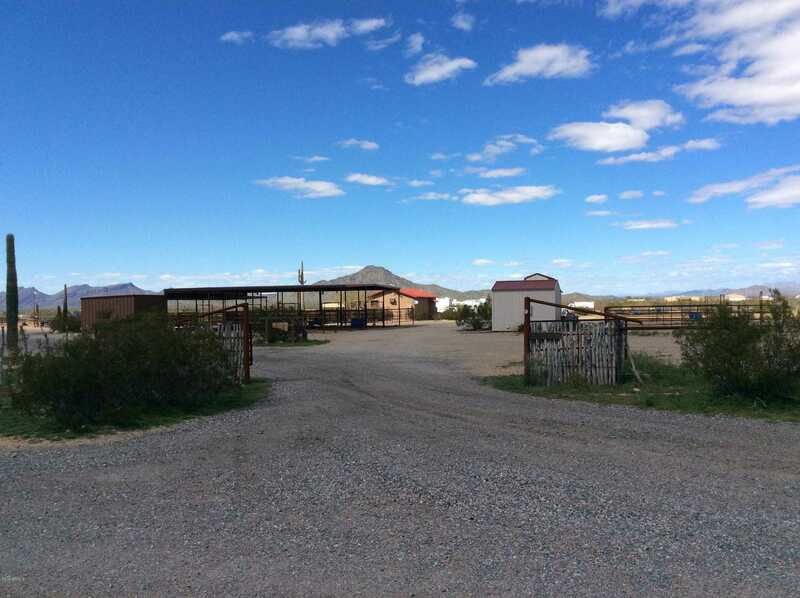 Roper’s/Horse Trainer’s here is the winter set-up you’ve been looking for.Suituated 0n 5 acres/with option to buy adjoining 5 acres with water.Home is an absolute 800 sq.ft.gem,patio withchairs and BBQ for the sunset dining.Additional building for gathering with friends,has a bar/restroom/shower.Pump house has additional washer/dryer.Two tack rooms,one in barn has swing saddle door and large cement area for shoeing /saddling with a wash rack,the 8 pipe pens have auto waters and feeders.Arena is all pipe (140’x280′),sand was hauled in,turn out area at back of arena,hay barn near with other pipe pens.Lots of room for big rigs to turn around and park on graveled yard,with RV parking.Very well set-up property,a must see for the serious horseman,area has a lot of team ropers. Directions: Approx.13 miles west of Wickenburg on Hwy 60 to Forepaugh Peak Rd.,then in short distance to mailbox’s turn left on Luray Rd.,first residence on right. Approximate size: 217233.00 sq. ft.